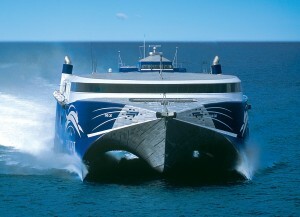 The Cat Ferry is a slick, high-speed catamaran, that gets you and your car from the American state of Maine to Yarmouth, on the southwest tip of Nova Scotia. It runs from late May to mid-October, with 3 to 4 sailings each week from both Portland and Bar Harbor. Once on board, you can relax in a cafe, take a punt in the casino or watch a movie. The crossing can be rough so take some motion sickness pills if you’re prone to seasickness. Saving on driving time is the main reason to take the Cat Ferry. It’s 3 hours on the boat if you’re coming from Bar Harbor and 5-1/2 hours from Portland but it takes about 10 hours to drive to Yarmouth from Portland. If you’re heading for the northern half of Nova Scotia, it’s just as efficient to drive through New Brunswick and save yourself the cost of the ferry. Book in advance, especially during the peak summer season and definitely if you’re planning to take a vehicle along. Don’t forget to allow an extra hour on either end for getting on and off the boat. The downside of the Cat Ferry is its cost. An adult foot passenger pays $69 one-way from Bar Harbor and $99 from Portland, plus a $10 U.S. security fee. From Portland, you can pay $139 return on a ‘Weekend’ rate and stay up to 64 hours. Children 5 and under travel for free. For a small car and trailer, add on another $115 for the Bar Harbor-Yarmouth run or $164 for the Portland-Yarmouth sailing, plus a $25 fuel surcharge each way. Save $10 by booking online but the system is hard to navigate. If you’re not technically savvy, it’s probably less frustrating to call 1-877-359-3760 toll-free. There are also vehicle discounts if you book a round trip instead of a one-way fare.